The registration of motor vehicles and boats. Regulation of new car dealers, commercial cargo carriers, private driving schools and private traffic schools. Ensuring convictions are recorded against drivers' licenses. Ensuring licenses are suspended or revoked if too many convictions pile up. Issuing identification cards for individuals who cannot hold a driver's license or do not wish to do so. The California DMV is the sole authority for certifying driving schools in California. California DMV approved driving schools are the most reliable choice for drivers' training in the state. 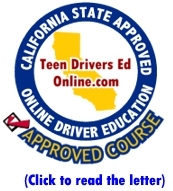 Ever since its inception, Teen Drivers Ed Online has been one of the very best California DMV approved driving schools in the region. With our unmatched service quality and unbelievable student success rates, most parents prefer our services for all their driver's ed needs. At TeenDriversEdOnline.com, we take pride in our ability to produce responsible and skilled drivers, time and again.